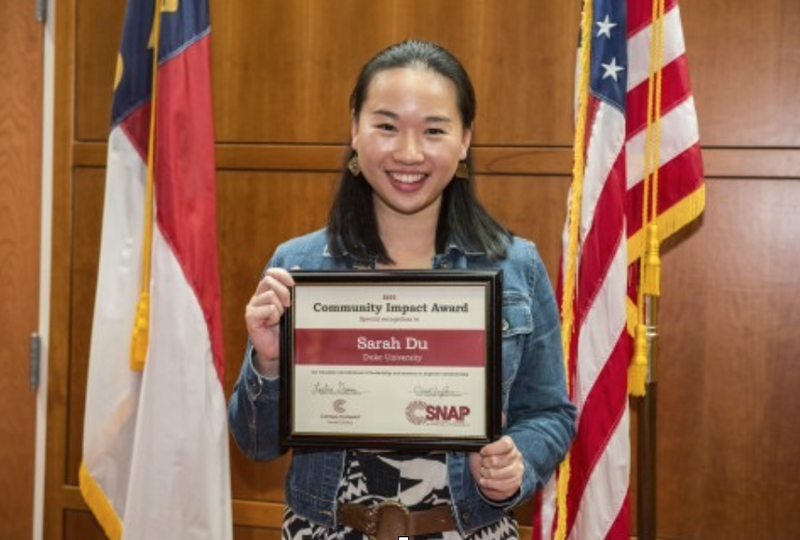 Duke University senior and DukeEngage alum Sarah Du recently received the 2015 Community Impact Student Award from North Carolina Campus Compact, a network of N.C. educational institutions devoted to encouraging civic engagement. The award allows each of the organization’s member schools to select one student who demonstrates exceptional commitment to partnership and leadership within their campus and community. The winners will be honored at the annual Citizenship, Service, Networking, and Partnership (CSNAP) conference hosted by the Compact on November 7th 2015. Sarah Du’s commitment to service is evident through her work as a DukeEngage participant, and her dedication to the program in years following. Du spent eight weeks of her 2013 summer in Bennettsville, South Carolina, working with the Children’s Defense Fund and Freedom Schools along with six of her peers. After her return, Du served as a DukeEngage Academy Leader to help prepare students to have valuable experiences similar to her own. As a result of her unwavering commitment to civic engagement, Du was also chosen to speak at the DukeEngage “Thanks a Million” event in September 2015, celebrating the program’s one millionth hour of service. Du is among the 21 students selected for this year’s Community Impact Student Award. The CSNAP conference will gather students and faculty from more than 20 North Carolina colleges and universities, and will feature training programs on engagement, leadership, and cultural competency. Du is currently majoring in Public Policy, and is working as a research assistant at the Sanford School. She accredits her interest in education policy to her DukeEngage experience and is continuing to explore service opportunities within the field in her home state of Washington.